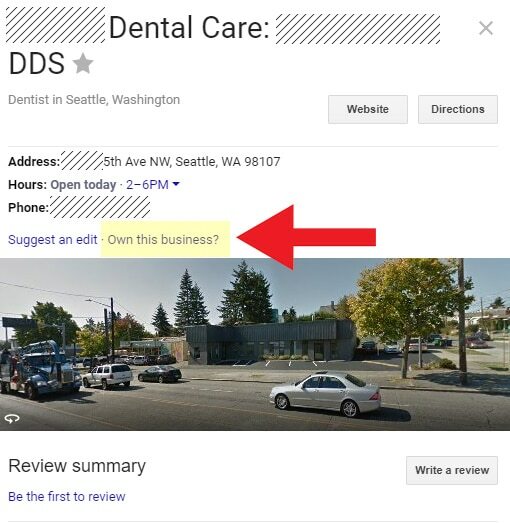 In our recent blog post, Local SEO for dentists, we discussed the importance of the tool ‘Google My Business’ in local SEO strategy. Google My Business is one of the easiest and most effective ways to help Google understand your dental practice. Optimizing your Google My Business and Local Maps listings are perhaps the most important steps to attract new patients online. If you rank well, your Local Maps listing is displayed at the top of local searches in the ‘3 Pack’. Most searchers click on the top reviewed practices in the 3 Pack, so it’s crucial that your business is displayed there. Google My Business is the foundation of your search engine optimization efforts. If you want to attract patients searching for a new dentist in your region, you need to pay attention to this tool. Google launched Google My Business (GMB) in 2014 as a way to unify Google Pages for business owners. Prior to GMB listings, most dental practices had Google Places, Google Plus pages, Google Maps, Google Places practitioner pages, and often duplicates of each. 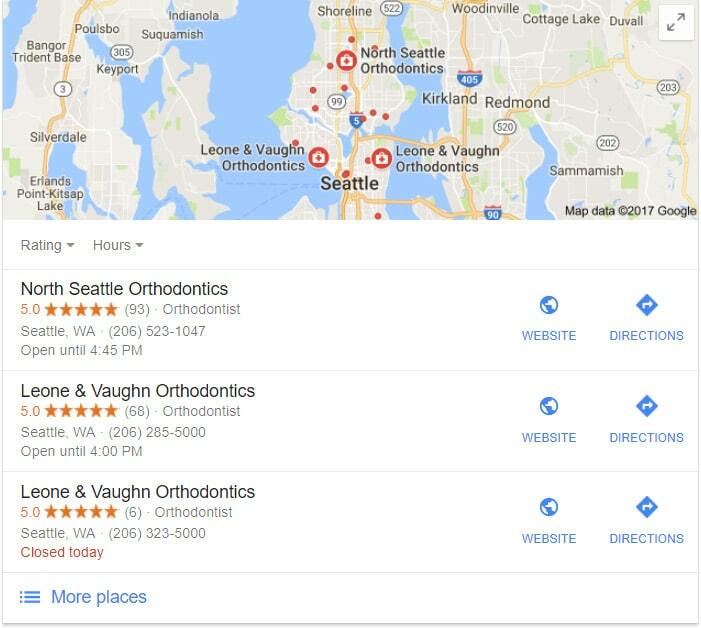 The current version of GMB unifies some of these Google listings with a free dashboard that helps dental practices manage their Google local search presence. GMB tools include unique analytics, the Insights dashboard, and some new tools that assist dental practices in communicating with prospective patients. These new tools include text messaging and posts. Posts will show up on your Local Maps listing. We recommend that most dental practices set up a Google Analytics, Google Search Console as well as a Google My Business account. Together, these accounts will help you understand your online search presence and website performance. GMB does not replace Google Search Console or analytics. 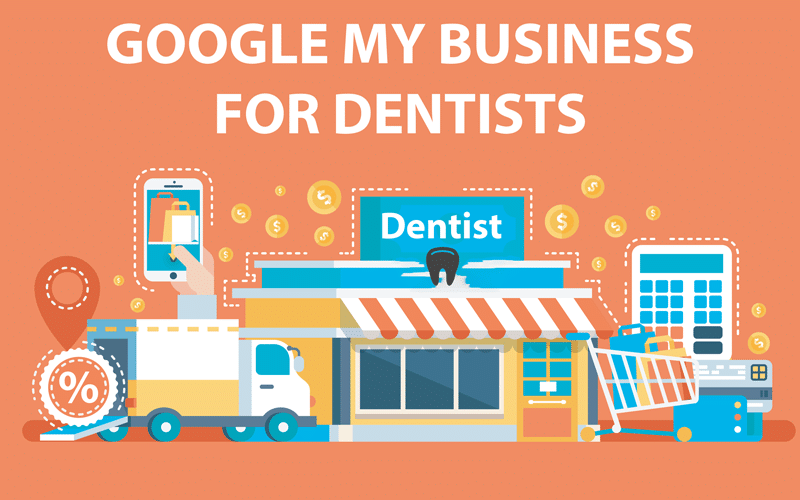 A Google My Business listing allows dental practices to keep their business information current. Existing patients and new patients will see this listing when they search for your practice name. Your contact information, hours, and driving directions are all displayed. An optimized GMB listing will also help you show up in the Local Maps 3 Pack search results. This placement can have the largest impact on your business because only 3 local practices are listed there. If you have a website that showcases your practice well and great online reputation, a Local Map search ranking will almost guarantee you new patients. Given the large number of people searching for a new dentist and the existing patients looking for your information, make sure that your profile looks great when someone is searching in Google. 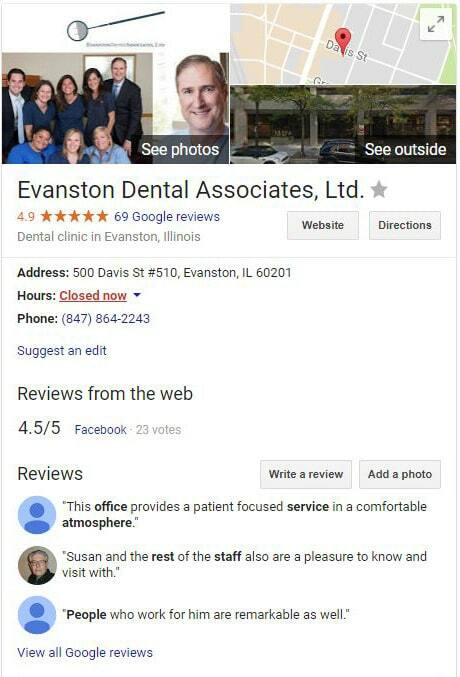 The Evanston Dental Associates listing on the right shows a well-optimized GMB listing card. The listing card showcases your practice, and displays essential business information and patient reviews. The card in the sidebar can make your practice appear professional and reputable or it can confuse and even turn away potential new patients. A verified listing that is properly maintained has a strong influence on prospective patients. Verified practices are twice as likely to be viewed as reputable and trustworthy by local searchers. (psos MORI (2014), “Impact of Search Listings for Local Businesses”). Practices that use great photos (photos that are crisp, bright, focused on people) also get far more clicks than practices than don’t. Google claims it’s up to 35% more clicks. This information is very valuable to a practice. If you don’t use GMB, your practice is missing out on a significant opportunity to understand and serve your patients. Google My Business profiles are easy to set up. 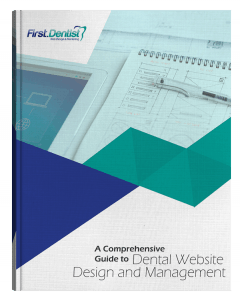 There are a number of ways to optimize a dental practice for local search and to help with conversion. We’ll cover the basic steps to creating an effective and eye-catching GMB listing in this article. To claim your listing, you need to set up a Google account to manage your Google apps. The first step is to set up an email specific for these management tasks. We recommend something like [email protected]*yourdomain*.com. You want to use your domain email so you can maintain ownership in the event of an employee leaving or you discontinue working with your marketing company. This dedicated email account will allow you to access the Google suite of products. You can set up the account at google.com/accounts. Don’t use your personal gmail account as you may need to share it, complete with username and password, with your marketing company. Don’t allow employees or marketing companies to verify the practice with their personal emails and cell phone numbers. It can be time consuming and difficult to reclaim the listing if they don’t cooperate with Google’s request to transfer ownership. After setting up your gmail account, find your practice listing at: gybo.com/business. If your practice is listed in Google Maps you’ll be able to claim or add your business there. You can also search in Google for your business name and if the business listing comes up, click on “Own this business?” and claim your listing. If it doesn’t show up, follow the process at the link above. You’ll be prompted to add or correct your dental practices business information. You must ensure this information is correct because you will be using the NAP across numerous online listings. Consistency is essential to assist with local search engine optimization. You’ll be selecting a business category. Select your primary category (like dentist or orthodontist) and several secondary categories. After completing your listing, you’ll be offered a verification option. Some practices can verify by phone or some must verify by mail. Make you sure you keep an eye out for your postcard code or answer the phone to get the code. It can take a while to get the code and you want to get optimizing as quickly as possible. It’s easy to lose the card or accidentally throw it out with the junk mail. Use your practice’s legal name and use it consistently for all of your listings across the internet. There are two types of listings, practitioner listings and business listings. We will discuss the two types of listing in a later blog post. In the meantime, register your business listing with your business name. Do not add any types of search keywords to your listing; doing so will only harm your listing in the long run. For example do not use “Jones Dentistry & Dental Implants Colorado.” Just use “Jones Dentistry of Colorado” if that is the legal business name. Google monitors for listing spam and penalizes practices who abuse the system. It’s also essential that all of your business citations across the internet match and if you add keywords the citations will not match. We see this tactic abused often and it only causes problems. Use your practice’s physical address, the same listing you use on your website. If you have several offices, create different listings for each office. Confirm your address in the map that will appear. Use your real practice phone number. Use that number on your website and your GMB listing. Do not use a tracking phone number on your listing. There are ways of using tracking phone numbers to measure ROI and leads from website traffic, but this is an advanced tactic that requires an understanding of how it can impact local SEO. If it is setup incorrectly, it can seriously damage your SEO efforts. Work with an experienced SEO and digital marketing company who can help you implement tracking numbers properly if you don’t have the expertise. Use the correct website URL across all of your marketing and online listings. Hire a professional photographer to take pictures of the dentist, staff, and office, and post these on your listing and your website. Make the featured picture a picture of the most photogenic dentist in the practice. People are naturally drawn to faces over pictures of offices and building. Never use stock photos. Most people can spot stock photos a mile away, and today’s patients are looking for authenticity. Here’s a sample of nice set of featured photos on a Google My Business dentist listing. Google has an reference page that provides you with information about the image formats you will need. A virtual office tour is also a great thing to put on your Google listing. You can contact a Google approved photographer to come to your business and create the tour. Any interactive features help to sell prospective patients. Find a Google Street View photographer here. Google has recently (Summer 2017), added the ability to communicate relevant and unique information about your practice. The new features are ‘Posts’ and ‘Messaging’. Google Posts allows you to show specials, promote events and showcase top services or new services. Posts allows you to give them a direct opportunity to make an appointment, learn more, or go to your website. You can manage posts from the dashboard or even the app on your phone. Google has also added the option to let customers text practices directly from their listing. In the age of smartphones and instant messaging, it’s an important option to add to your front office. You must add a phone number that can receive texts to your GMB account. The number isn’t shown to patients but will receive text messages. Google My Business is a foundational component of your online marketing efforts. Google has invested considerable effort into making GMB more usable and valuable for dental practices. The recent addition of messages and posts shows that Google is serious about encouraging practice owners to be engaged with their GMB profile. Practice owners and managers also need to be monitoring reviews and insights from the monthly data. It’s a good time to start using GMB at least on a weekly basis to assist with your online reputation management and search engine presence. Google My Business is a foundational component of your online marketing and search engine optimization presence. Make sure you use your legal practice name so that it matches citations across the internet. Make sure you use high quality images and ideally hire a professional photographer. A lot of potential patients will be making their first impression of your practice from this listing. Spend time reviewing and understanding the data in your dashboard. Spent time regularly in GMB and take advantage of the new features they are rolling out. It’s a great way to get a leg up on your competition. If you are interested in having us review your local search presence and Google My Business listing, please contact us with the button below. We’ll review your site, your search presence and your top competitors in your local area. It’s a valuable strategy session we are offering for free for a limited time.